Remove any store stickers from the squash. Bake on a cookie sheet at 375 degrees for about 40 minutes, maybe longer for larger squashes. Squash is done when it starts to brown on top. Err on the side of caution as an overcooked squash will not have firm (and fabulous) noodles (though they are still tasty and edible. 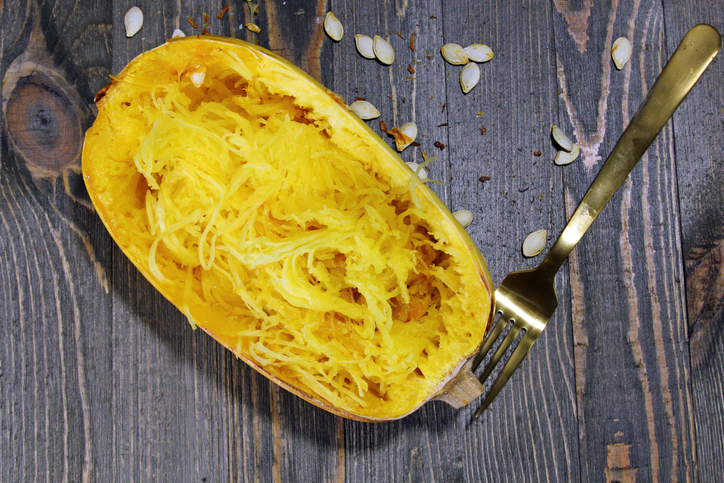 Cut the squash in half immediately after removing from the oven to release the heat and prevent further cooking. Allow to cool. Scoop out seeds. Use a fork to separate the noodles. Garnish as desired.